You may know how the game that eventually became Donkey Kong was originally meant to star Popeye - Mario would have been the sailor man, Pauline would have been Olive Oyl, and DK himself would have been Bluto - but Nintendo was unable to secure the licensing rights. With that in mind, you almost have to wonder if Crash Bandicoot, the poorly-drawn Australian marsupial who attacks things by spinning at them, began life as a pitch for a Looney Tunes Tasmanian Devil game. Crash Bandicoot is back! 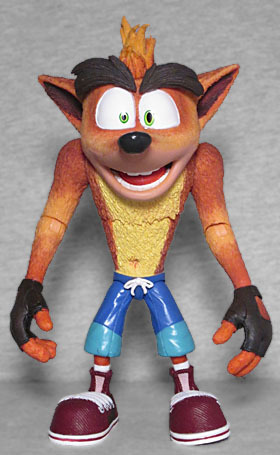 The eagerly anticipated action figure line from NECA features Crash Bandicoot as you know and love him! Your favorite marsupial has plenty of articulation for maximum wumps, but just as importantly, he's outfitted with ball-jointed eyebrows to create a variety of crazy expressions. As a bonus, tucked inside is an easy-to-assemble, thick cardstock crate replica! Relive all your favorite Crash moments and get ready to put some UMPH in your WUMP! While Taz was an influence on Crash, the real impetus behind the character's creation was the desire to cash in: 3D games were on the rise, but there were no 3D platformers yet, so Andy Gavin and Jason Rubin decided to tap that market. They also opted to develop for the nascent Sony Playstation system, rather than a more established brand, because while Nintendo had Mario and Sega had Sonic, Sony had nothing - this was their chance to create not just a videogame character, but a mascot. Crash had action figures before, from the dear departed ReSaurus, but toymaking has come a long, long way in the intervening two decades. 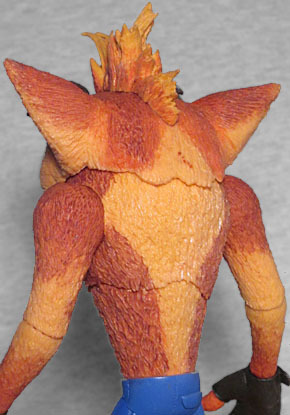 For instance, the 1998 Crash toy had a smooth surface, free from details, while the sculpt Jason Frailey delivered for NECA covers Crash's entire body with a fine coat of fur. The only spots on him that don't get textured are his eyes and the skin around his mouth - even the nose has that nubbly, rubbery texture like a dog's nose. Considering that the original character model in the first three games was built from only 512 polygons, this is definitely a toy that captures the "feeling" of the character rather than the reality - even the recent remastered version of the game doesn't look as awesome as this toy does. The expressive face was one of the things that set Crash apart from Mario and Sonic; "it's'a me" and "fast" aren't exactly deep character traits, you know? 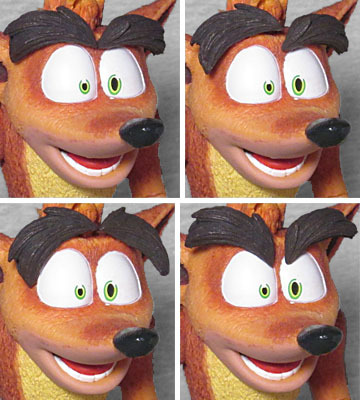 Crash may not have had a voice, but he had the emotional range of an actual cartoon. This figure homages that strength by making his big bushy eyebrows as separate, articulated pieces! They're mounted on balljoints, so you can twitch them about however you want. Angry Crash, surprised Crash, quizzical Crash... they're all the same Crash! If NECA could somehow combine these with the movable eyes from their mogwai figures, it would make the most expressive action figure ever! There are gaps in the green paint that creates his irises, which I took to be an error, but the stock photo on the back of the packaging shows them the same way. The rest of the toy's articulation is terrific, as well. 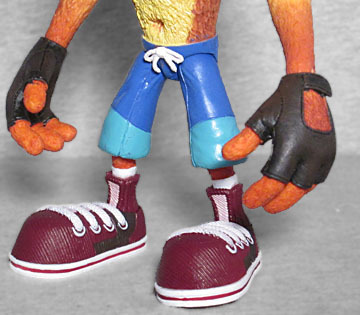 Beyond the eyebrows, Crash has a balljointed head; swivel/hinge shoulders, elbows, and wrists, a balljoined chest; balljointed hips; swivel/hinge knees; and balljointed ankles. It can be tough to tell at first which way the joints move, but once you get them going, it's a lot of fun! The huge head might make him a liability for tipping over, but the giant feet help mitigate that. Naughty Dog, the developers of the game, were already squeezing more power out of the Playstation than anyone thought possible (in fact, some of their competitors swore up and down that the first demo at E3 1996 was running off faked hardware or that Naughty Dog had access to secret internal Sony specs that no one else was given, both of which are obviously incorrect), so they ran into a problem: they couldn't have more than two or three enemies on screen at any given time, which left the levels feeling sparse. The solution? Crates! Crates to give you lives, crates to give you fruit, crates to give you whatever the game needed to give you. And because a crate is simple, there could be 10 of them on screen before they started taking up as much memory as one enemy. Smashing them was fun, and everyone loved them. Pretty quickly, the levels went from "some crates to fill space between enemies" to "some enemies to fill space between crates." They even gave Crash his name (which is why we're not reviewing a toy of Wezzy the Wombat today). Rather than spend the money to mold a plastic crate, and have to make bigger packaging so it would fit inside, NECA included a thick cardboard version you fold together yourself. 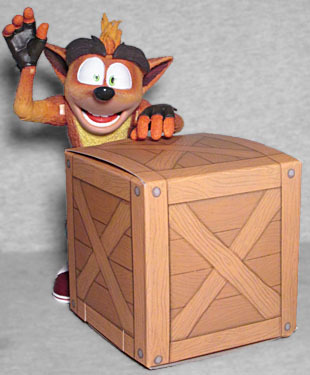 It would have been nice if Crash at least came with a wumpa fruit or an Aku Aku mask, but hey, a crate is better than nothing. Crash Bandicoot came out at the same time as Super Mario 64, and while Mario may have been the better game (because Shigeru Miyamoto knew more about the nuances of controls and balance than Naughty Dog did), Crash had better visuals. Plus, it got a sequel the next year, while Mario fans had to wait until 2002. 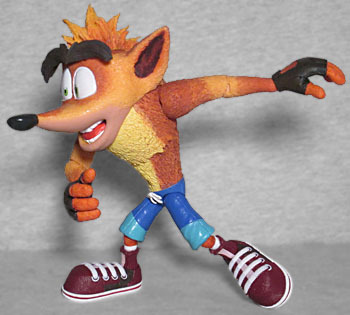 For a time, Crash Bandicoot really was competing with Mario, and while he's not exactly the Playstation mascot he might have been, his game pushed things forward, and NECA has delivered an outstanding toy of him. He, Kratos, and Nathan Drake can all get together to point and laugh at Master Chief.